Check out great deals on 2 Denver Nuggets games for all Colorado Crossroads attendees. Receive great deals on Colorado Avalanche Hockey tickets for all Colorado Crossroads attendees. Have some fun on Colorado’s longest and fastest ziplines! 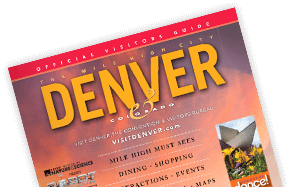 Receive admission to some of the city’s most fascinating attractions, all for the bargain “Mile High” price $52.80 or three attractions of your choice for $25.